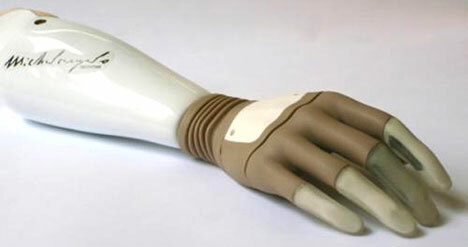 The MichelAngelo bionic hand is a new hand prosthesis created by German medical manufacturer Otto Bock. The bionic hand was successfully implanted in a 28 year-old man born without a right hand. Take a look at this Spanish television video demonstrating the use of the MichelAngelo bionic hand. It took four weeks for Axel Eichinger to learn to use his new hand, which is a skeleton made from stainless steel and aluminum with a soft skin-like covering. The MichelAngelo prosthesis is designed to function in a convincing and graceful way, offering biomimicry rather than mere robotic functionality. SF readers and viewers were aware of these possibilities a generation ago. In Martin Caidin's 1972 novel Cyborg (made into the Six Million Dollar Man television series), Steve Austin has a bionic arm. A reader has reminded me about Mannie O'Kelly-Davis, the computer tech in the lunar prison, who has a mechanical arm with a number of different attachments. From Heinlein's The Moon Is A Harsh Mistress. Here is a fistful of mechanical hands for you to grasp. Blue collar droids get their wish this Christmas - better hands! Very quick to respond, the only difference is the 'clacking' sound it made when it gestured. A remote-controlled robotic hand will soon enable medical specialists to examine women from anywhere in the world. A rescue robot modeled on the movie Terminator. Better than Hollywood special effects, it provides more degrees of freedom and advanced feedback control.